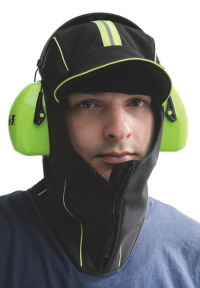 Howard Leight’s new Polar Hood is an earmuff accessory designed to provide optimal attenuation and hearing protection for workers exposed to cold climates, according to the company. The balaclava-style Polar Hood is compatible with all Howard Leight earmuffs, and features patented side panels that eliminate gaps between the ear cup and the ear, forming a tight acoustic seal around the ears without distorting sound or attenuation, the company says. Its weather-proof design makes it ideal for workers in the construction, oil/gas/petrochemical, food production, and other industries exposed to cold weather conditions. Other features of the Polar Hood includes a seal around the face to prevent further exposure, an adjustable design that includes a front zipper for ventilation, and a foldaway visor. Bright green trim enhances visibility and safety outdoors. The Polar Hood is available in two sizes, small/medium and large/extra large.